In need of some creative Christmas card ideas? Take inspiration from these designs as we take you through ten quick and easy makes. Looking for a creative way to use gems when crafting Christmas cards? Here they have been arranged in the shape of a Christmas tree and fixed to clear acetate. We love that you can see the festive paper through the design! This card is completed with a shiny Christmas sentiment die cut from shiny gold mirror card. Nothing says ‘Festive’ more than a Christmas tree! This design has been crafted from two triangular pieces of festive paper, if you fix with foam pads down the middle you can bend the edges out for a 3D effect. A glittery sentiment has been added to the bottom and, of course, no Christmas tree is complete without a shining star on top! Backing paper has been added to the inside of a Simply Creative reindeer-shaped card to make this fun Rudolph design. A red pom-pom nose, glittery star eyes and extra Christmassy embellishments from the Dovecraft Christmas craft pack have been added to complete the look! Snowflake designs are everywhere throughout the festive season and they have been used as the centrepiece of this glittery design. Papers have been layered to create a decorative strip down the centre of the card, complete with die cut snowflakes and gems for added sparkle. 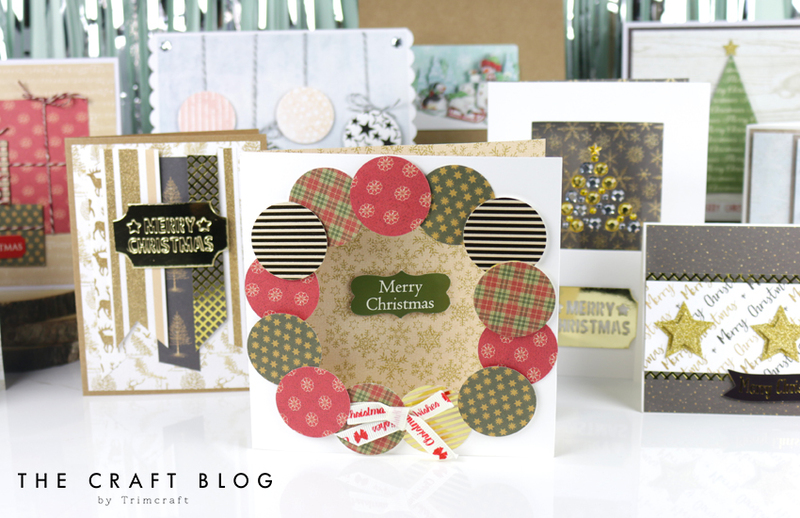 Here’s a shining example of how you can craft the perfect Christmas card! Decorative paper covers a card blank, with a complementing design placed as a strip down the middle. Three glittery stars adorn the centre of the design, which is completed with a Christmas sentiment. We love this creative Christmas wreath design! Circles have been cut using a die and have been arranged around the circular aperture. Festive paper has been fixed to the inside of the card and the design is finished with a Christmas bow and sentiment. For the focus of this card, twine has been wrapped around three squares of designs before being layered to a sheet of decorative paper. This is completed with a Christmassy sentiment. How cute is this shiny bauble design? Twine has been fixed to the back of a piece of paper and secured in place on the front with die cut circles in a variety of designs (we love the shiny paper used here). A stamp has been used to add a sentiment and gems added to each corner for some extra sparkle! We love the cute snowy scene on the front of this card! The festive decoupage image and complementing sentiment have been attached to the card blank for a very Christmassy finish. This shiny and sleek flag design makes for a trendy take on the traditional Christmas card. A card blank is covered by a festive paper design and complementing flag shapes have been layered and attached to the front. A gold die cut sentiment finally takes centre stage! Which design will you make? We’d love to see so don’t forget to #trimcraft when uploading to social media and to share your projects in the Inspiration area!